Member Price: $130 Public Price: $170 Reserve your seat now. JBF Award winner Michael Anthony has been wowing diners of all stripes for years with his lauded seasonal cooking at New York City's Gramercy Tavern. While writing the restaurant’s cookbook, he found himself drawn to the most vegetable-forward items on the menu and quickly decided he needed to share his passion for produce with the public. 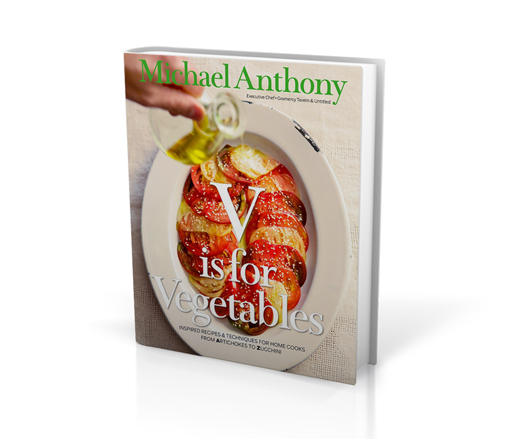 The result of his efforts is V is for Vegetables, a new tome written for the home cook and featuring options for herbivores and omnivores alike. Organized in a charmingly accessible a-to-z format, V is for Vegetables will guide readers through the alphabet of asparagus to zucchini with recipes, techniques, and illustrations to make their next trip down the produce aisle a culinary expedition. Enlightened Eaters is an educationally minded series of readings, workshops, discussions, and other programs focusing on health, nutrition, sustainability, and environmental issues.